Today I want to share with you how I made my own homemade face cream. You only need 2 ingredients and a very little amount of time for this diy face moisturizer! Give this homemade moisturizer a try. You won’t be disappointed. I have been on a “make it myself” kick lately! I just love how there are so many different products that we can make ourselves with little to no effort. We are slowly trying to incorporate more and more natural products into our daily routines. It hasn’t happened over night but gradually we are transitioning to natural products. It feels so good to know what we are actually putting on our skin. Plus, these products are simple to make and cost very little. 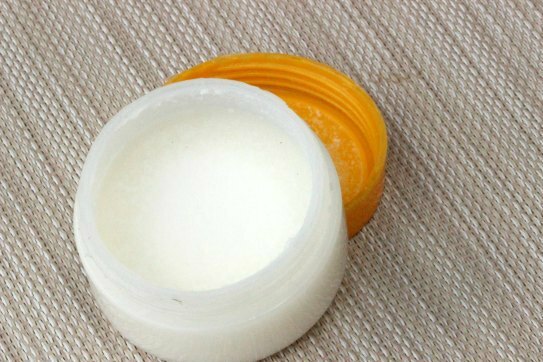 This diy face cream has only 2 ingredients! If you have stepped into a store lately, you know just how expensive beauty products can be. Plus, they each have a laundry list of ingredients that you probably can’t even say! Make your own products and save a ton and have peace of mind about what is going on your skin. 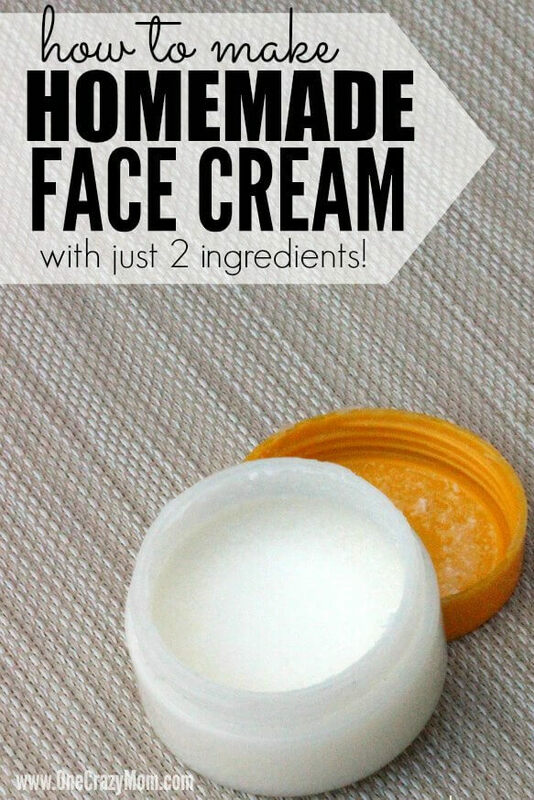 You will love learning how to make face moisturizer. It is truly the best homemade face moisturizer for dry skin! It works for all skin types so it’s very versatile. Some recipes use shea butter or cocoa butter but I prefer to use the coconut oil on my face. It leaves my skin so soft and doesn’t feel heavy at all. We all know that we need to take care of our skin and facial moisturizing is the foundation of skin care. It also helps to stay hydrated and drink plenty of water. This helps dry skin say supple. It also helps with anti aging. 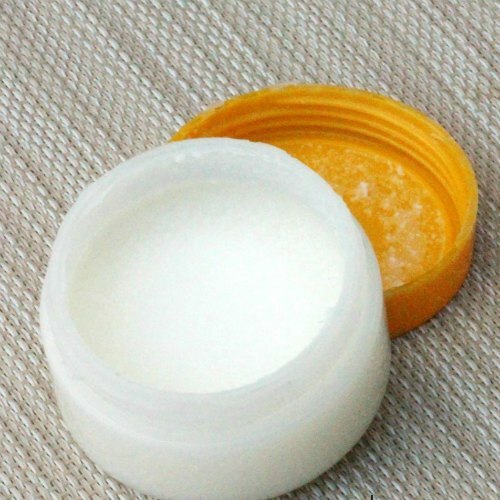 Whether you have oil-skin or acne prone skin, try this homemade face cream. It is now one of my favorite beauty products and helps me have sensible skin. We have made The Best All Natural Cocoa Butter Lip Balm, DIY Body Lotion , DIY Bath Bombs Recipe and many more! I love being able to control what goes into our products. No worries about chemicals or additives. These recipes are very simple too and do not cost a lot. It’s not time consuming or expensive to make your own products. You will love trying these new products. This is the best DIY Best homemade face moisturizer! I don’t know what it is but lately my skin has been so dry and this Homemade Face Cream really fixes that. 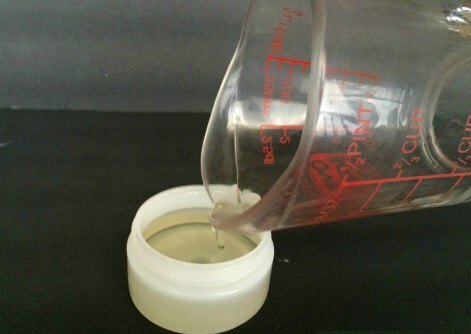 Skip the overpriced face creams and dry this frugal DIY face moisturizer cream. I think you are going to love it too! I keep a container in my purse and it also works on dry hands and elbows. We are always making something around here so I keep containers on hand. It’s nice having what I need when I decide to make a product. Plus, I find they are cheaper online. Also, these bottles can be reused. Once you use all of your lotion, just wash and reuse the containers. I love that you can do this because it saves even more money in the long run. Yeah! You’ll also need a small container to put your face cream in. I had an old container that I cleaned out and reused. You might want to dig through your drawers to see if you have an old container you might be able to re-purpose for this cream. It is very easy and economical to make a large batch of this homemade face cream. 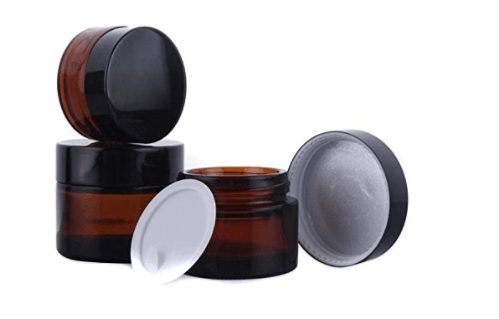 If you are thinking about making a big batch for gifts (think slumber party, bridal shower, teacher gifts…), you can purchase small containers from Amazon. 1. 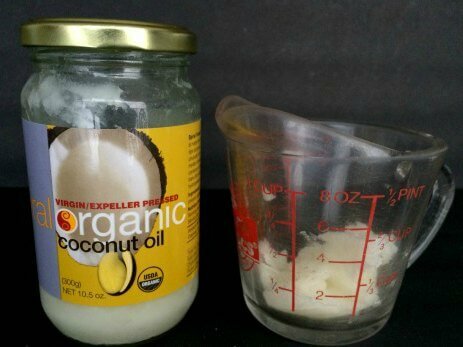 Scoop about 1/4 cup coconut oil into a microwave safe dish. Microwave for about 30 seconds, or until completely melted. 2. Add 6-8 drops of essential oil to your melted coconut oil. I chose Tea Tree oil because it is great for your skin. You can use it directly on your skin by itself, but you have to try it in this face cream. It feels heavenly. Other great essential oils for your skin include: frankincense, ylang ylang, sandalwood, lavender and more. Learn more about essential oils here. They really are wonderful and have so many uses if you are just learning about them. 3. Pour the coconut and essential oil mixture into your container. Set aside until it becomes solid again. I love to use this before bed. When I wake up, my face feels glorious. My skin is so soft and moisturized. It’s like I went the spa. It’s that soft and my skin is glowing. My makeup looks better after I use this at night and I even get compliments on my skin. Now that you know how to make face moisturizer, it’s very simple! Try this homemade face cream for yourself. I’d love to hear what you think of it. This homemade face lotion is also a great homemade hand lotion! I’ve actually been keeping this fun little homemade face cream in my purse and it is also working great for a homemade hand lotion on the go. It fits nicely in my purse and really helps with dry skin, especially after washing my hands in public bathrooms. What is about those public bathrooms? The soap is so drying! This homemade hand lotion will help with that! Especially in the winter when I’m washing my hands constantly when all the germs are floating around. My skin just stays horribly dry and then starts to itch. 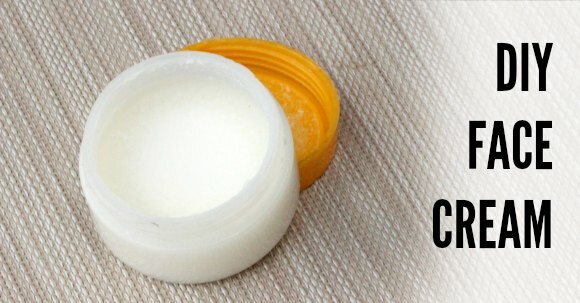 Relieve dry skin this easy DIY cream. Try this frugal DIY moisturizer for dry skin today! It’s very easy to get overwhelmed with trying to make everything at once. Do not do this! Just make a list of what you would like to make and tackle one product at a time. We did not make all our natural products at one time nor did we convert to all natural products overnight. It took time and in fact, we are still a work in progress! Don’t get frustrated or overwhelmed. If you try to do everything at once, it will be so easy to get frustrated and give up. Take that pressure off your self and just do what you can when you can. Before you know it, you will have a long list of natural products that you have made and now use in your home! Start with one product a week. If that is too much try every other week. Or if you feel that you have more time, maybe try 2 in one week. Basically, everyone is different and just do what works for you and your family. 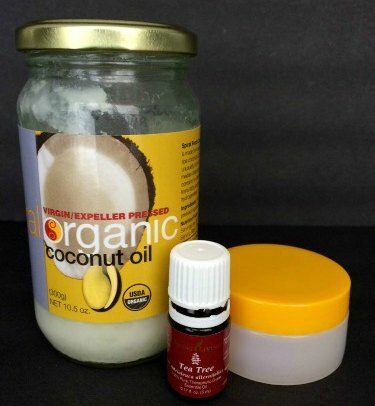 You are going to love using natural products and especially this diy face moisturizer. With easy recipes like this, it’s a great place to start. It can’t get any easier or simpler with a recipe that only calls for 2 ingredients. Yeah! In case you are wondering what in the world a 2 product face cream could actually do, prepare to be amazed! After you try it, you will wonder why those store bought creams have so many ingredients and what exactly they are for! I love to dab this moisturizer on my hands during the day and they feel so luxurious. So it’s not just for your face! Although it is great on your facial skin. My favorite is to put this cream on at night when I go to bed. I wake up with my skin feeling amazing. It is so soft and hydrated and just feels so good. It’s a great way to wake up and start your day! Let’s face it, Mom’s do not always take care of themselves well. We are so busy taking care of the kids and the husband and everyone else. It’s easy to push ourselves to the back burner. Well, if we aren’t taken care of eventually it will be hard to take care of others. I have learned the hard way that it’s so important to take a few minutes for ourselves. Sometimes I feel guilty thinking I should be doing something for the kids but truly investing in myself makes me a better Mom. Don’t you agree? So, take a few minutes today and pamper yourself with some of these amazing DIY products. You will save money and your skin will feel amazing. Just to say l have been making this receipe as make up cleanser and face cream for twenty years , I’ve been impressed with the way it leaves my skin feeling cleansed and soft. I will be honest and say it may be a little greasey if you use more than a pea size amount . Worth trying and a great saver of money . Thanks for sharing as I wanted to find a simple facial moisture, which I did.